Since the hit NBC comedy, The Office, ended its run in 2013, John Krasinski has been trying to shed the skin of everyman Jim Halpert, who he played for nine seasons; 188 episodes. To meet that end, Krasinzki played parts in Cameron Crowe’s infamous bomb, ALOHA; Michael Bay’s lowest grossing movie to date, 13 HOURS; did some low-key voice work in fairly forgotten animated films (THE PROPHET, ANIMAL CRACKERS), and he directed and starred in the 2016 comedy drama THE HOLLARS. 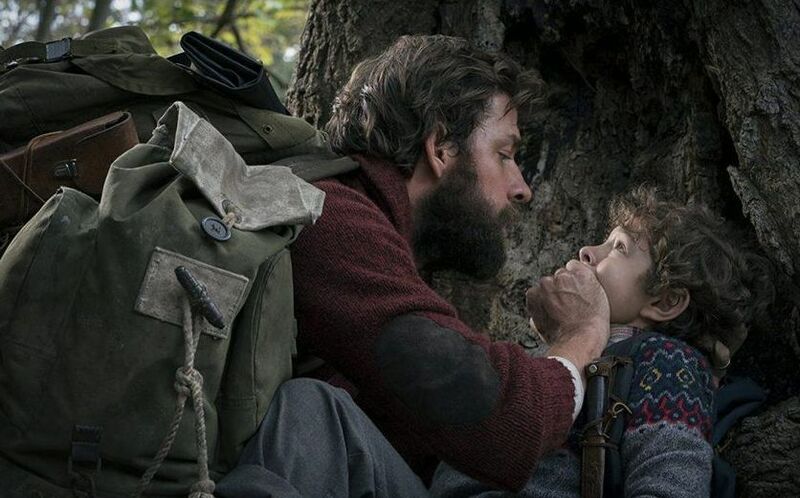 Much like his directorial debut, 2009’s BRIEF INTERVIEWS WITH HIDEOUS MEN, THE HOLLARS got mixed reviews, and didn’t make much of a splash, but now with his third film, A QUIET PLACE, Krasinski has made a major leap out of the shadow of Jim. Krasinski, who co-wrote the screenplay with Bryan Woods, and Scott Beck, stars as husband and father, Lee Abbott, though we never hear that name out loud as he and his family, including his wife Evelyn (played by real-life wife Emily Blunt, and their deaf daughter, Regan (Millicent Simmonds), and their sons, Marcus (Noah Jupe), and Beau (Cade Woodward), have to be completely quiet or else they’ll be attacked and eaten by demons. You see, it’s yet another post apocalyptic landscape with, you know the drill: shots of an abandoned town with walls covered with missing persons flyers, the ransacked shelves of department stores, and newspaper headlines like “NYC on Lockdown” interspersed into the set-up. 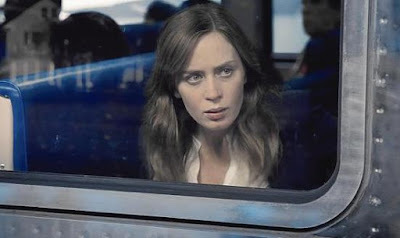 Another headline, “Stay Silent, Stay Alive,” lays out the Abbott family’s lifestyle as we see them communicate in sign language as they quietly make their way and back on a trip into town to get supplies during the film’s prologue. The Abbotts live on a large farm, with corn fields, and multiple silos, and have taken precautions like stringing lights throughout the property which can be switched from yellow to red to warn the others of danger, and having fireworks on hand so that they can distract the monsters with loud noises when needed. And with Blunt’s very pregnant Evelyn about to give birth, lemme tell ya, they are needed! We never learn where these blood thirsty creatures came from, or any other info about how large parts of the population were annihilated by them, we just get the Abbott’s tale of survival with the dad’s attempts to make contact with any other survivors via his shortwave radio bringing little hope (“it never works!” signs Regan). With a cast of only six people (there’s an old man played by Leon Russom that they run into in the woods), precious little dialogue *, and a fair yet sparring amount of CGI for the demons, Krasinski has made a stirring, nerve-racking, and tensely effective thriller that never lags. It’s a confident piece of construction in its pacing, and with its edgy emotional pull it feel like you’re right there with these characters right up until its satisfying ending. Krasinski gets a lot out of this simple but powerful premise by bringing a lot of heart to it. You can feel the warmth between he and Blunt, like when they share a moment listening to Neil Young’s “Harvest Moon” through shared earbuds, and in how they work together to get their newborn baby to safely. Blunt, by the way, has the movie’s most terrifying scene, involving having to give birth in complete silence in a bathtub by herself as creatures crawl through the house around her. The kids’ performances deliver too – Simmonds is strong as the determined oldest sibling who feels unloved by her father, while Jupe is “on” as the very scared younger brother. Marco Beltrami’s subtle score never intrudes on one of the film’s other big stars – its sound design which successfully made me feel every aural instance. This is a movie that anyone who talks during should be immediately escorted out – its spare use of sound will reward its audiences’ complete silence. 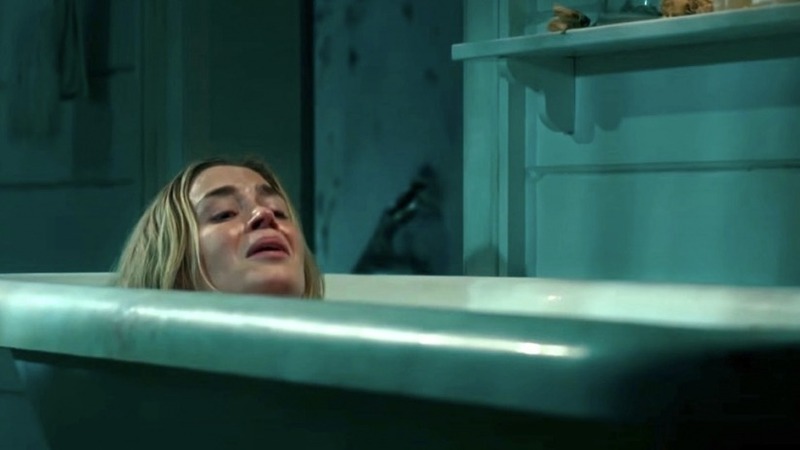 A QUIET PLACE is quite an exciting surprise from Krasinski. It goes to show like Jordan Peele before him with GET OUT, these actor/director/writers can carve a new niche for themselves in with low budget yet high concept horror productions that can come in on an off season and make a killing. Of course, it also helps greatly that Krasinski, like Peele before him, has made a movie that’s scary good.